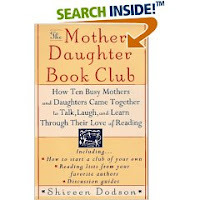 This book, The Mother-Daughter Book Club: How Ten Busy Mothers and Daughters Came Together to Talk, Laugh and Learn Through Their Love of Reading, by Shireen Dodson caught my attention when I was at the Friends of the Library book sale. I picked it up on the third day of the sale when you could by all the books you could shove into one box for $2. (For which I took the biggest box I could find and stuffed it full of familiar and unfamiliar titles. Why not? For $2?!?) I thought it would be curious to hear how someone else has gone about collecting a group of people for a book club. For those of you who are not informed, I started Bookfest, an online book club, in 2006, as a means of staying in touch with some of my friends in a manner which we would all enjoy. This year, for example, we decided to read two books each month as a group. There are 12 of us involved so we were each allowed to select two of the titles which will be read this year. It's been a lot of fun. Feel free to pop over and see what we've been reading. I've enjoyed Bookfest so much both as a means of fellowship and as an interesting way to think outside of my reading "comfort zone." Everyone in Bookfest likes something a tad bit different. Everyone has something to contribute and we all enjoy (or not) reading what someone else has suggested. Books are a part of each one of us and each title is a reflection of our own individual personalities. Hence, I was motivated to peruse this Mother-Daughter book club idea, not so much because I have a daughter (because I do not) but because I find it curious to hear of how other people have come together through books. The M-D Book Club is written by Shireen Dodson who is the Assistant Director of the Center for African American History and Culture at the Smithsonian. She says she was originally motivated to form this club in order to build a relationship with her daughter as well as to "expand the common ground for friendship between [her daughter] and herself." I don't agree with the way she views many topics in books and how she approaches reading as a general rule. I disagree with her view of classics, in particular. She definitely has a more liberal view than I do. 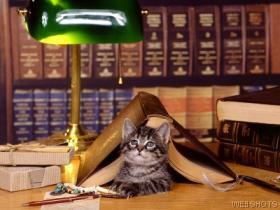 However, she has good basic ideas of what it takes to form a good book club. Because I see the value of having a group of people to connect with through reading, I'd like to give away my copy of this book as inspiration to whoever might need it (or be curious about such clubs in general) to form your own club. I'll pay shipping and you can just enjoy the read. Now, how to win? Hmm. Leave a comment explaining why you either need this book, want this book, have to have this book, just like random contests, have an obsession with owning as many books as possible, etc. Whoever gives me the best reason (in my own personal opinion) for why they think this book would be useful for them wins the prize. Basically, entertain me. If I can't decide who gave the best reason, I'll submit it to the Blog Readership for a vote. The deadline for the contest will be Friday, June 1st. I will announce the winner on Saturday, June 2nd. At the very least, even if you aren't interested in reading along with others and fellowshipping over the thoughts and ideas of other people - I do hope you are reading for yourself. Reading to Know. That's what this blog is all about! I saw your blog as well as Bookfest and wanted to let you know of a site my wife and I started recently. The site is called CurlingUp.com and is a literary community where people can discuss the books they are reading as well as post book reviews and create on-line book clubs/discussions. We would love to get your groups feedback on the site as well as have you participate in the discussion. Please stop by when you have some time. I love the "Friend of the Library" booksale idea. My local library quit doing this several yers ago and I miss it. Don't enter me in the contest though. I already own so many books that need to be read that I'm out of room.